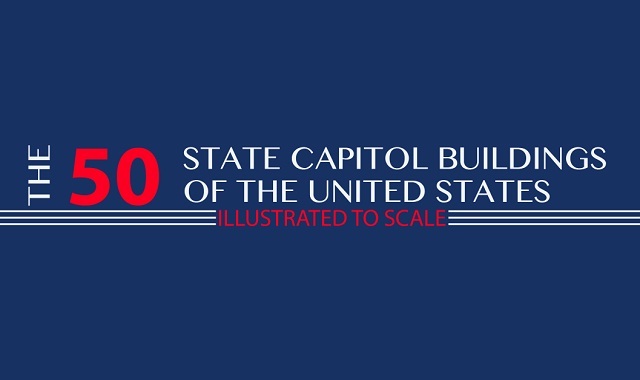 The 50 State Capitol Buildings Of The United States Illustrated To Scale #infographic ~ Visualistan '+g+"
Many US citizens wonder about how each of the US state capitol buildings compare to one another. This graphic explores common questions, such as: Where each building is located in their state; how much it cost to construct each building; and how that cost equates to today’s US dollars. Because these buildings are drawn to scale, we can also easily compare their relative sizes. Another question answered is: How many state employees work in each capitol, per 10k of the population? Many people may be surprised by which building is the oldest, which building is the most expensive, which building is the tallest, which building is the shortest, etc. These pieces of information are conveniently included next to each building, for easy reference. The most interesting aspect of the graphic is how similar some buildings are to one another, while others are completely different in design. This graphic can be enjoyed by people of all ages.